Curtis Granderson catches a fly ball at U.S. Cellular Field. Curtis Granderson being dealt to the Yankees three years ago. Growing up a baseball fan in Chicago there were two things you had to detest: the St. Louis Cardinals if you were a Cub fan and the Yankees if you were any sort of baseball fan. There are many players on those teams you can respect, admire or really envy. But between all their wins and the intense rivalry over the years, it&apos;s so much easier to just — dare I say it — hate them. The exception for me is if they were with the Cubs or the White Sox. Then they are given an exemption. But now I have to come up with a new category of exceptions after spending time with Yankee centerfielder Curtis Granderson. This three-time All-Star was drafted by the Detroit Tigers and was dealt to New York three years ago. And, he is a true Chicagoan: He went to high school at Thornton Fractional South and played baseball at the University of Illinois-Chicago. Ever since he joined the majors, the word is that Granderson is one of the friendliest players around. It&apos;s true, and I found out first hand. Here he is, a Yankee from Chicago, and everyone wants to talk with him — radio talk shows, TV stations, writers, former coaches and staff — and somehow he has time for everyone. There is no rolling of the eyes or the feeling that he is "too good" to spend time with people. Since he was still a junior in college when he was drafted by the Tigers, he asked Detroit to let him forego Instructional League until he finished the semester. Granderson was able to complete his degree with a double major in business and marketing management before joining Detroit&apos;s minor league team. Having parents in education wasn’t the only reason he wanted to complete his degree. "I enjoyed school," he said. "I had that sense of accomplishment when I studied hard and got good grades.” One thing about Curtis: When you bring up his parents’ line of work, he is very proud to add that his sister teaches English at Jackson State University in Mississippi. As a Tiger, Granderson made a name for himself with his tremendous play in centerfield and at the plate. In 2006 he went to the World Series but came up empty; then, three years ago, he was dealt to the New York Yankees. Since then his odds of going back to the Series has increased. The glare of the spotlight has not been too intense in the biggest stage in baseball. Granderson credited playing in a World Series, All-Star games and the World Baseball Classic to good preparation. “It wasn’t a shock, surprise or something foreign to me when I came to New York,” he said. I had to ask him about dealing with the New York media, as he did have a “moment” with them. Granderson was asked about the conditions of the field that was chewed up from non-baseball activities. “It looks a lot worse than it actually is,” he told the press, yet the headline read "Curtis Granderson bashes outfield." Even though the quote didn’t say it and the story didn’t imply it, he didn’t get angry — Granderson knew the writer wasn’t responsible for the headline. 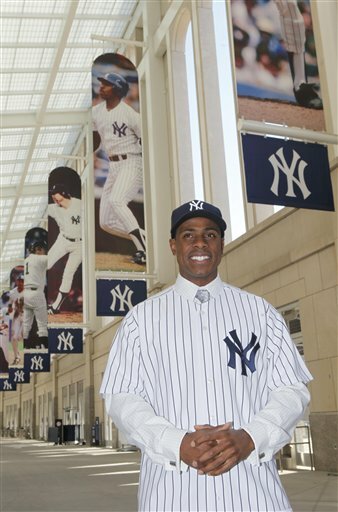 To add to the notion that he is one of the most amicable players around, Granderson travels the world as an ambassador for Major League Baseball. He also has written a book for kids, All you can be: Dream it, Draw it, Become it. Curtis is also involved with several charitable organizations. Just in case you are wondering — White Sox or Cub fan? Neither! Curtis explained: “I was neutral when it came to both Chicago teams. I like them do well for the city.” He loved the Atlanta Braves since they were a successful team in the ‘90s that he watched on TBS. Granderson is a successful player on the most successful team in baseball. I will just have to put him in the category of terrific player and person — on a team I still can’t like.